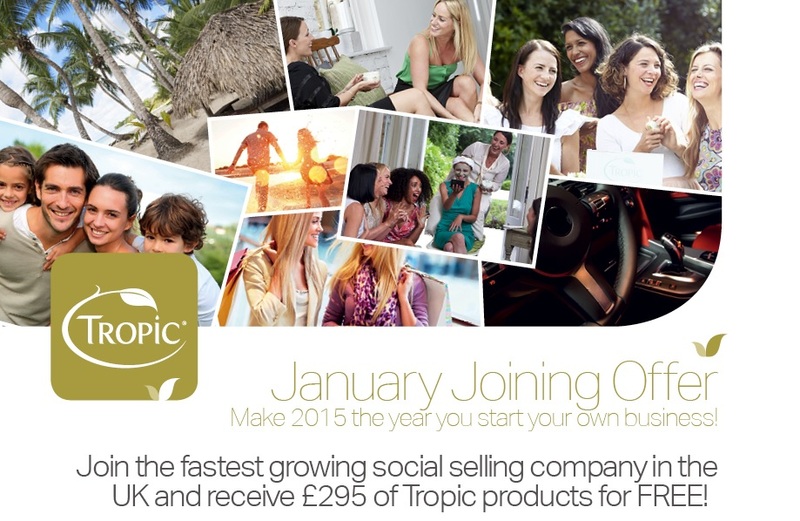 Join Tropic this January! New Year, New You, New Business! Why not start your OWN business in 2015! There couldn’t be a better time to join our 4000 strong Ambassador family! Make more time for the family this year and pay for those all-important holidays and treats in life by selling our award-winning natural skincare and cosmetics to beauty lovers all over the country! Join in January and receive your Tropic Leapers’ Kit (£295 of Tropic products) for FREE! This offer is exclusive to new Ambassadors and is activated once Leap Ahead Levels 1 & 2 (+4 days grace for Tropic Essentials Kit to arrive) have been achieved. Categories: General | Tags: Join Tropic, Mumpreneur, New Business, Tropic, Tropic Ambassador, Work from Home | Permalink.